O.k., so this is our last lesson and last 3 weeks! This class officially ends on 18th December - with the next class (that will be a repeat of this one) starting on January 9th, in case you fell somewhat behind and want to continue sending videos. There will be a special, half-price option for everybody taking this class in case you want to join January class too, just as many people from April class joined this one. 1. include the dog-walk in sequences, still reward really good ones or really difficult ones, but mostly, keep running as the reward. If the contact is not good, stop and redo. Try to go to as many different places and on as many different dog-walks as possible to get the dog used to everything. When first trying it on a new place, use your dog's favourite set-up, you can also throw a toy in advance if that helps. Again, new dog-walks can be a very easy step for some dogs, but a very difficult one for others. It's usually a problem with sensitive dogs, retrains or long-strided dogs if the dog-walks are different lengths. 2. even if already doing a real DW, let's go back to the table+low plank set-up, in a seperate session from DW training, put a pole at the end of a plank (where the contact meets the ground) and have the dog jump on a contact from the side to wrap a pole. Use your wrap cue first, but then switch to left/right or come/away cues as the pole won't be there for ever. Click for touching a contact with front feet (not for wrapping) and reward from your hand. Slowly have the dog jump on a plank from further&further away, so that he needs to do a stride and then two before wrapping the pole. Don't worry if hind feet are together in this case, your major focus are front feet now anyway, front feet are better for turns. Gradually start them further&further, use less&less noticeable (smaller and thinner) pole and make a plank higher&higher and then transfer it to the real DW. Tell them left/right at the middle of horizontal plank (can be somewhat later for shorter striding dogs), first do turns vs. straight exits in different sessions, then mix it up. A warning: teaching turns might temporary make your straight exits worse (so still do plenty of those too!) - but in a long term improves them as they get even better understanding on how to meet the criteria at different speeds. As an alternative, instead of teaching turns, you can teach 2on2off (the same way, on a lower plank first and backchaining it, using a different verbal cue) and then use it for tight turns off the DW. Only introduce it on a real DW once your running contacts are good enough. 3. new rear end awareness trick - backward weaving: tell the dog to go into heel position and start spinning as we were doing on the target, then very suddenly stop and step back with the other leg (if the dog is at left side - with right leg), you can also make a gesture with left hand to try to get them to keep circling below the heeling position, eventually all the way around you leg, so that they come backwards between your legs back into front position. If the dog insists on staying in heel position, you can help with the hand a little bit, lure his head out (left for 90 degrees if the dog is on left side) and say back to have them back up in your direction. Step back with the other leg enough to have them back up between your legs. Reward and tell them to heel on the other side (right) and repeat the process. As soon as you get some smoothness with that, stop rewarding for coming in between, always first tell them to come to the other leg and reward at your side in order to avoid having them back up too far - they need to stay very close to your legs all the time. Good luck to your future RC training and I hope to see you again in another class! Here is video of today’s session. I wish I had good news to tell you but I dont. The last few sessions have been horrible. Zero extension on that 2nd stride on the down ramp. I tried adding in that carpet you suggested and it had no effect. I’ve tried 2 tunnels, favourite set-up, throwing ball in advance, just trying to “let her get confidence over time” isnt working either. She seems to grasp the RDW concept pretty well when there is hard approaches or angles; but ironically the easier approach is what makes us struggle. It’s really strange how she is going back and fourth between really nice and too high contacts… It just doesn’t make any sense. What if you do some back to basics work and just run over over the flat plank again? It might transfer to full DW well if you can get her to extend there. It’s like it comes in waves. She never has sessions where some will be good; others will not be. They’ll usually awesome hits; or those super high ones. And they come in bunches; will have 3-4 great days… then it will all go to hell and unless I changed something (typically make it lower) she will not be able to get out of her low confidence funk. My dogwalk planks wont go totally flat. So would it be ok if they;re 2-3″ off the ground ? 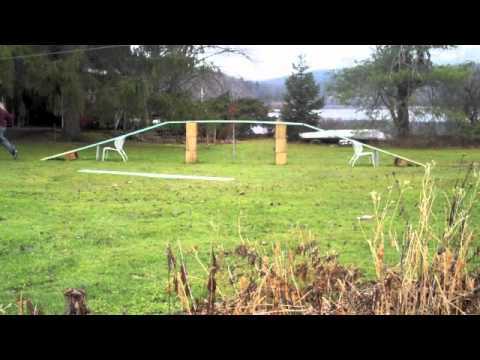 I do have a super flat 10ft” plank on my backyard… but there isnt a ton of room. Would you go from flat plank to full height dogwalk ? Or ? Did you try training less? Like giving her 2 day break after 2 good contacts days? In general, does a break make her contacts better or worse? I would say it should make them better as she would be more excited then and extended more? For the DW plank, do you mean it would have to be raised 2-3″ on one end or that it would create an edge with the ground for 2-3″? First would be o.k., second not. And yes, I would do plank work just aside normal DW work. I actually don’t have a dogwalk at my house… so we dont train everyday. I just spend a ridiculous amount of money on arena rentals 🙂 Atleast I own the equipment. Typically, we’ll do dogwalks a minimum 3 days a week. Sometimes 4. I never do dogwalks on back-to back days as thats how the arena schedule works out. What makes her dogwalk worse is if something happens; and she gets high hits the issue doesnt fix itself. I typically have to make a change in order to get the deeper hits. I happen to have complete 10 foot wooden dogwalk that hasnt been used in years. It’s a bit different then my professionally made 12 feet dogwalk; but I should be able to make it usable. I sure hope the plank work will help! Start with just a plank, not a whole DW. And next time something happens (and you notice it), just stop immediately, go to train something else and only try a DW again after several days, preferably a week. If you know the repetition won’t make things better, then don’t repeat high hits at all. Silvia, are you talking about the 10ft “plank work”; or the 12 ft boards ? 12ft would be better, but I though you can’t put that one flat and you will from that reason use 10ft? She offers deep rear feet hits on it. Here is our first session on turns. We had 10 tries before i videotaped the session. She is so cute ! It seems she not even needs the pole ! I looked at your turn video again and it looks like Bu is hitting with his rear legs pretty consistently; with front legs just off the board getting the turn. Am I seeing that right? I’m focusing on FF with Tai. We had another session yesterday, paying better attention to where his front feet were hitting (and marking that instead of the turn)…it went very well. So, just wondered about Bu’s solution. She normally hits with front foot, followed by hind legs and I checked the video and she is in with front foot every single time. She hits with front foot on about the spot where hind feet hit then too -- so no reach forward 🙂 -- but that’s normal for collection. So you’re doing the right thing to focus on FF yes. Thanks…I looked again and can now see the FF hitting…it looks great! As you will remember the minute we raised the dogwalk slightly Blaze started leaping again. I felt this was due to her toy obsession and lack of thinking!!! I ended up doing two of your suggestions. One was bringing in a target (in way of carpet on part of the down contact) and the other was fading the toy. We had some good and some bad sessions and a little loss of confidence from both of us but little bits of brilliant too. We then took 10 days off all contact training to re group. Here are the last 3 training sessions. I would love your input. 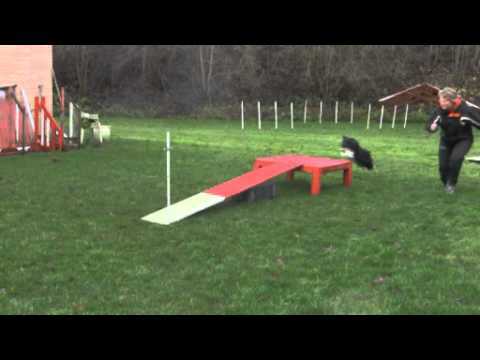 The set up is a wrap jump (no rail) to the dog walk and there is a jump with jump bump beyond the dogwalk and the toy is beyond that. At this stage the toy is fairly visible). Today I started asking her some questions with moving the wrap jump out and changing sides. Had some fails but on the whole felt pretty good. PS: do you have an even better deal for those that do the course a third time LOL!!! Can you tell me in feet how long your down plank dogwalk ramps are ? regs here in New Zealand range from 2.4 to 3 metres long. I think mine are 2.75 metres but would have to check. Can you tell me your height of DW? Thanks Silvia. I’m actually not letting her have the toy for the leaps at all, she calls off it well and tries harder the next time. She struggled with this for a couple of sessions but seems to have worked through it well. Hi there classmates, dont worry, we will also be there for the next one, “3rd class” for us too. Ah, o.k., then just keep working like this, it certainly looks like you’re on the right track now! I had a great (but short) session with Blaze yesterday with only one rep not rewarded. It was a totally different dog this morning. She went back to trying for 3 strides instead of 4 and we only had 2 rewardable reps. Some were from same approach (off a wrap jump) and some off a pinwheel of jumps (so more speed). When this happens, change her approach so that she comes from an angle, with less speed. You can use a pole or a wing at the beginning to still assure safe approaches. Once the height goes up, 3 strides will be less tempting, so if angled approaches give you nice running back, you can next try to add some height too. We’ve done some different approaches, also using a less visible toy at the jump beyond the dogwalk. This has caused some interesting changes in her stride. I’ve felt it was a confidence issue so have rewarded if she had nice hits even if the stride a bit odd. It seems to be improving. Tried some rear crosses -- not good at all!!! I’ve not raised it any yet. This class is finished. So just a short answer: looks GREAT! What you call an odd stride is actually her, putting an effort into adjusting her stride in order to hit it, so you should definitely reward or even jackpot it. In general, I would probably be rewarding more as you do as I definitely see some nice adjustments -- even in those 3 strides tries, she is trying really hard to extend enough to hit (and she actually does!). I think you can raise it some, you’ll get less 3 strides tries then anyway. Have a great Christmas. My dogs and I are going swimming at the beach on Christmas Day while everyone else is eating turkey!!! Wow, thats a big difference from what we see hear in Canada (and the USA). I only see 12 feet (about 3.65M) boards up here. 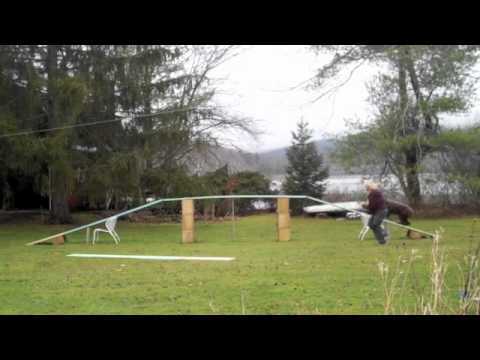 Silvia, do you think me training on 10ft boards (3.04M) will help with Viper’s lack of extension and create more front feet hits ? We see 3.6 to 4.1m here 🙂 I didn’t know about those differences before RC classes, but then asked about the length when I noticed most US BCs do 4 strides, when most FCI BCs do 5 🙂 And yes, a shorter board will give you more front feet hits and might be o.k. to start with, but we can’t practice full out extension on too short board… Or maybe we can as she won’t be flying an apex there and will start higher on the board -- so definitely worth trying! Here’s Spec’s first time on a full height DW. Very low reward rate but he kept changing things. Hopefully he was trying to sort out how to do it. Had to try numerous things to have much to reward. Is this normal or should I try something else? I would do some sessions more to see what’s the trend and then decide what to do about it. I would try straight approaches mostly as the striding in 19 is close to what we’re looking for. Reward high hits too at this point to give him more confidence. Here’s the last 2 days of DW work for Spec. We did mostly straight approaches starting with a sit/stay, jump, DW, jump, or a wrap to the jump. The reinforcement rate is getting better. There are a number of times he is soooo close to being in the yellow. Today I videoed full DW so you could see his striding. Do you think there is too much bounce in the top board and I should brace it? Looking forward to your input so I know where to go from here. I think his major problem is that for his natural stride length, 4-stride DW would be the best, but he shortens the one on the top plank and tries to do a down ramp in one hit instead of doing 1.5 hits meaning rear feet on the top of a down ramp first, then front feet above the contact and hind feet in the contact. He seems to avoid striding through the apex and even when his front feet hit so much at the end of a top plank that I’m sure hind feet will reach nicely on a down ramp, he puts rear feet on the same spot as where front feet were and then tries to fly the apex. He can still reach in, but it’s dangerously high, because of that too-short third stride. Bounciness of a top ramp could be a reason, so do try to brace that. Also, check that there is no gap between top and down ramp where he could get hurt if stepping on and maybe avoid that spot from that reason -- you can tape some carpet or rubber over it if necessary. You can also try throwing a toy in advance, ideally so that he sees it when taking the third stride, to see if that will make him stay in extension. I would play some with that for few sessions and if nothing helps, maybe do some sessions on a lower height again, it really helped with Cecilia and Ninja who had the same problem, Ninja started to avoid striding through the apex after falling off the DW once, but lower height + throwing a toy early really helped getting it back. Braced the top ramp of the DW. I don’t think the gaps are a problem from what I see. In the second video I decided to change the picture so had Spec run the DW in the other direction. Didn’t really seem to make much of a difference. Still not a great reward rate. He’s so close or just barely in on a large number of DW’s. I’ll try throwing a toy tomorrow to see if that may help. Also thought about running him over the planks on the ground prior to doing the DW. I actually liked 4 and 15 of the first video the most as it looks the most like 4-strided DW that would be the easiest for him to do if only he would stride over that second apex. I would exclusively do straight entries for a while now and try to get more of 4-strides DW -- you actually got more of those in the second video already, he just need to extend some more on his 3rd stride. Please check Cecila&Ninja’s videos, they had exactly the same problem. I found your comments to Cecila&Ninja on page 2 of lesson 5. Were those the comments you were referring to or should I check lesson 4? Do you think lowering the DW would help with the leaping over the 2nd apex, and being in the contact zone deeper in 4 strides? Looking forward to your suggestions. No, it was an earlier conversation, when we lost striding over an apex with Ninja… You can check Spec’s videos too and see when you last see him hit a down ramp with rear feet first. In this video, he is doing some of this (with one leg for now), so maybe we’re getting there, but might be it would be easier to get it on a low DW -- you can try and see what you get. Thanks Silvia. I’ll keep looking for the post, and will lower the DW for the next session. I was hoping to train this afternoon but the weather isn’t cooperating. I live in the desert but it does very occasionally rain and today is one of those days. Yes, my left&right cues have more “loose” meaning as cik&cap. When used before the jump, it means jump left/right in extension and when I use it in tunnels or on the DW, it means turn tight after the obstacle. I originally used them for turning on flat (after a jump, DW, tunnel, whatever), but as Bu required more info and wanted to know how to jump when jumping in extension too, I had to use it before the jump and that brought us to this inconsistency -- that my dogs&my students’ dogs happen to understand perfectly 🙂 It’s good that dogs are smart! Silvia, I went back to the plank to warm up. I used a new toy, a glow-in-the-dark ball. I filled the apexes with little pieces of foam. I think its been almost three weeks since she has seen our homemade DW. I kept it short and sweet. RDW training -- she's back! Maybe tomorrow I can start again with turns? Just put straight tunnels at either end? Or what should I do? Just this? I have two more days here… until next week. That sure looks great!!! I would do easy stuff mostly, somewhat angled approaches and exits maybe, but nothing too radical. I have a question about ups. A friend asked with her BC, so I told her I would ask you. Could she use a ramp to a table? Placing a toy on the table and jackpotting for hits? Yeap, Bu is still work in progress too, but as long as the trend is good, I wouldn’t worry 🙂 And yes, sure, you could use a plank to a table with a toy for up contacts! We have not had an opportunity to do much training. It seems it may never stop raining :-(. I have taken them both to 3 other dog walks over the last couple of weeks and worked on straight extis and both did great. Still working on sending to static toy with both dogs. Seems some days they get it and others they don’t but I am confident with time it will click. I have a question, will the content of this class still be available after the class ends. I find that I go back to other videos and comments frome time to time for reference. Thank you Silvia for leaving the classes on the web. I still refer back to various things when I have a question, or need a visual on something.